Most Class B biosolids are used on farms, on sites with little public contact. Examples of Class B biosolids used for agriculture are from water resource recovery facilities (WRRFs) at Essex Junction VT, Nashua NH, Franklin NH, and Lewiston-Auburn ME. Some Class A biosolids are managed in the same ways as Class B biosolids: in bulk, applied with manure-spreading equipment, fertilizer spreaders, or liquid injectors. Generally, site permits are not required for Class A biosolids, because pathogens are minimal. Examples of Class A biosolids managed on farms in bulk are from WRRFs in Halifax NS, Concord NH, and Guelph ON. All biosolids should be applied at the agronomic rate and in accordance with best management practices (BMPs), ensuring the optimum application of nutrients for the crop to be grown while protecting ground and surface waters. Land applying Class B biosolids before seeding, Maine. Septage land application for hay crop, central New Hampshire. Applying Class A biosolids pellet fertilizer before planting turf grass crop, Rhode Island. Delivering Class B biosolids to corn field, Quebec. Injection of liquid Class B biosolids, Essex Junction, VT.
Stockpiling Class B biosolids for application between cuts of hay, central Maine. 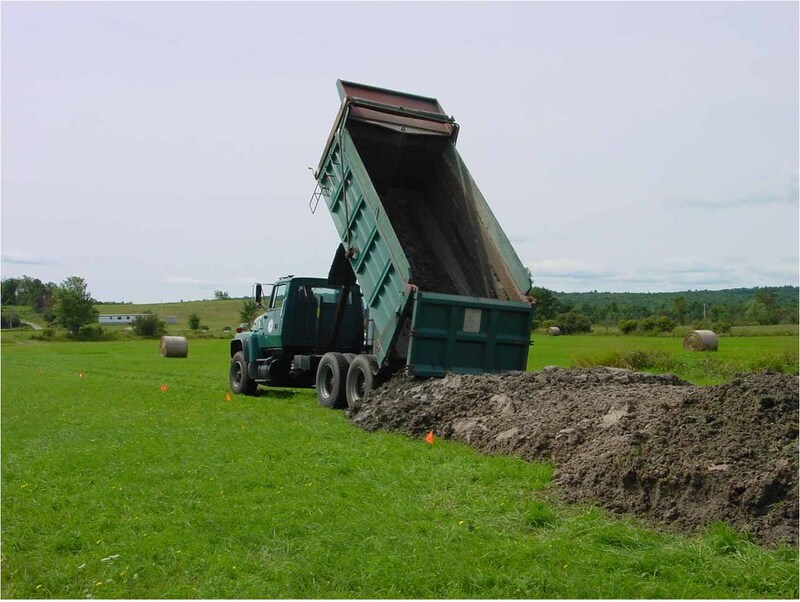 Land application of Class B biosolids, Quebec.